Not just for Children or Rainy Days. 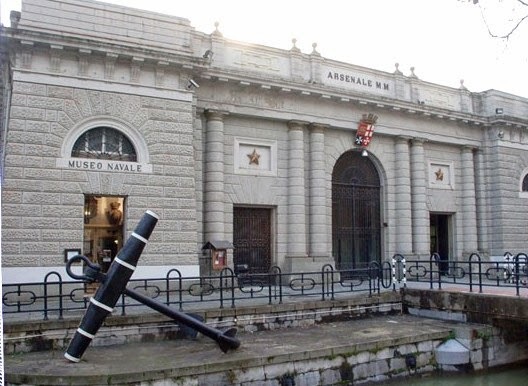 This is a museum people really love, and it's the most important naval museum in Italy. The museum's roots go back to 1430, and many artifacts are from well before the 1861 Unification of Italy. Yes, it's an old fashioned museum, but it's the good kind of old fashioned. There are figureheads from real ships you can walk right up to, glass cases with delicate model ships, and great big cannons. It's true that the captions are sparse, and there's only a smattering of English, but this fascinating place offers so much we don't mind leaving some questions for the next visit. What is There? No matter your interests, if you were ever a child, you'll find things to fascinate you here. This is only a sketchy list, but you'll get the idea. Model Ships. There are over 150 large scale models of ships - including Roman boats; Venetian boats; Vespucci's ship; the Nina, Pinta, and Santa Maria of Columbus; and ships of every vintage. Figureheads. One of the world's best collection of figureheads including a giant dragon, a huge salamander, mythical and historical figures, the figurehead from the British Royal ship Cambria of 1846, and that of the Royal frigate Italia. Early Radio. The actual equipment from Marconi's early radio experiments from La Spezia in 1897, which developed mobile marine use. Artillery. An extensive display of every age, technology and size. A few examples - squat early mortars, a whole range of early cannon showing the increasing size and sophistication, large artillery from real WWII ships. They have a large cannon whose barrel exploded, showing 4 inch thick metal peeled back like a banana! Torpedoes. Numerous examples showing their increasing sophistication, and including the famous 'maiali' - manned torpedoes! There are more than a dozen gyroscopes for controlling them displayed. Rifles and Pistols and Such. There must be a fifty examples of military carbines showing their development. A large collection of pistols covering many types. There's even an early Gatling gun (machine gun) seized in the Chinese Boxer Rebellion in 1901. Miscellany.Telemetry equipment for aiming, and anti-aircraft guns for defense. A covered stealth boat which sank a British Cruiser in WWII, an early submarine powered by compressed air. Yet More? Yes, a sample: anchors and medals and lanterns and pilot wheels and painting and stuff we didn't understand. (Museo Tecnico Navale di La Spezia) 0187-784693 or -78111. (100 meters inland from the west end of the waterfront). Daily 9:00 am – 7:30 pm. Free with obligatory 1.55E donation. Call to inquire about guided tours in Italian and English. Coming by train from Cinque Terre, it's just a 15 minute walk from La Spezia Centrale train station.